It ain't working. Eight years after the outbreak of the financial crisis, central bank chiefs suggest they have saved the world, but have they? We argue central banks have become part of the problem, not the solution. At its core, their indoctrinated focus on inflation may well do more harm than good, with potentially perilous implications for investors. Most central banks have a mandate to promote price stability; the Fed is said to have a dual mandate to also maximize employment. Over the decades, we believe most economists have come to believe pursuing an inflation target is the holy grail of modern central banking. As such, it's not a surprise that by arguing inflation is too low, central bankers have justified the pursuit of their various policies since the onset of the financial crisis. Some prominent central bankers, including European Central Bank (ECB) head Draghi, have argued the law requires them to pursue an inflation target, thus pursue potentially ever greater monetary easing; and that if there are unintended consequences, 'macro-prudential' measures ought to be employed by policy makers to address those (as an example, the argument is central to this speech by Draghi last February). Our interpretation: Draghi sees his role as doing whatever it takes, and don't blame him if there are unintended consequences. While Draghi may be more radical in some of the tools he employs, we consider his "leadership" as a symptom of the environment we are in. Inflation targeting isn't working. Below is a chart of market-based long-term inflation expectations for the U.S. and Eurozone (EZ). If we are not mistaken, Draghi shutters when he sees long term inflation expectations sagging; we believe former Fed Chair Bernanke would have long been tempted to resume quantitative easing (QE) looking at this chart. Fed Chair Yellen is a labor economist, so she may not be quite as glued on this particular chart. The Fed, in general, also likes to point out that there are other (survey based) measures of inflation that don't paint that bleak a picture. Why is it bad that inflation expectations are ticking downward? Isn’t your purchasing power improving when inflation is low, even negative? You might say that as a saver, but if you have debt, you might prefer inflation. Economists have figured out that workers have a greater incentive to work if inflation chips away at the purchasing power of your hard earned cash ever so slightly every year. A credit (read: debt) driven economy might go into reverse (a deflationary spiral) if inflation is too low. It’s why we sometimes state that incentives of a government in debt may be very different from those of investors. The biggest bully tends to grab everyone’s attention. Be that Mr. Bernanke, under whose leadership a formal inflation target was established at the Fed; or be that Mr. Draghi, who has suggested he’ll pursue the ECB’s inflation target no matter what. In their defense, they firmly believe that a big part of achieving an inflation target is to shape expectations that such a target may be achieved, and putting up a good show (it’s called communication) may well be part of it. As such, we don’t mean to personally offend them in implying they may be bullies; it’s part of their institutional role that they tend to bully the market. Unlike the U.S., other major central banks around the world do not have an explicit employment target; the argument against an employment target is that the best way to achieve maximum employment is indeed by providing price stability. If, however, employment were the focus, the central bank might be at risk of becoming politicized (which would be bad for the effectiveness of the central bank and ultimately inflation). The short of it is, central bankers the world all over have learned to love the inflation target; so much so, that is has become a formal target in many countries; while it isn’t the law in the U.S., the Fed adopted a formal target under Bernanke’s leadership. So why am I arguing the Fed's mandate isn't inflation targeting? Because the law clearly puts a litmus test on monetary policy, namely that they must be "commensurate with the economy's long run potential to increase production"
We believe many economists would agree that an economy’s long run potential is reflected in its long-term interest rates; more specifically, it is reflected in long-term interest rates net of inflation (long-term real interest rates). The rarely mentioned third mandate, namely, “moderate long-term interest rates” refers to just that: higher longer-term rates are desirable if they reflect a potential to increase production rather than inflation. And that’s another sign that the stubborn focus on inflation targeting has failed, as long-term nominal interest rates are at 1.5%, as measured by the yield on 10-year Treasury Note. If policies being pursued were working, these rates would be higher. The Fed’s focus must be on the economy’s long run potential. Our take is that just as maximum employment has long been understood to be the result of pursuing a policy of low inflation, we argue that low inflation itself is the result, not the cause of a policy focused on an economy’s long run potential. 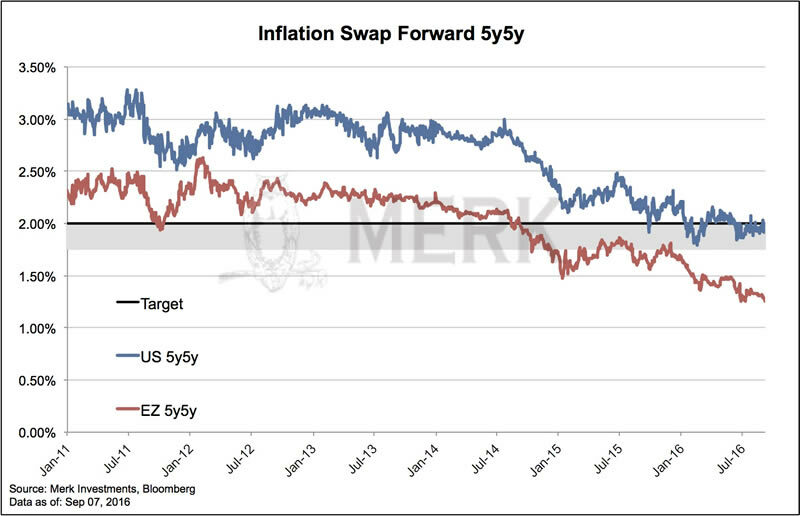 If inflation targeting were the solution, we should not see inflation expectations sag. Something is wrong. Central bankers appear to argue that they simply haven’t doubled down enough. Maybe they should pause and take a step back. When we take a step back, we interpret the Fed’s mandate to focus on the economy’s long run potential to suggest a rule that we believe should take priority: do no harm. If the Fed, and other central banks, gave a higher priority to the harm their policies might be doing, they might be more humble in their pursuit of policies in uncharted waters. Economists will counter that there will always be winners and loser, and that it would simply not be workable. In our humble opinion, though, that’s not the right way to look at it. We believe central banks should consider whether the policies they pursue might be harmful to its mandated goals. One can argue, and we would agree, that for an economy to reach its optimal long run potential, much of it is in the realm of fiscal policy. The Fed’s mandate is on “monetary and credit aggregates”; as such, it appears all too obvious to us for the Fed to cross check whether they deviate from a focus on ‘monetary and credit aggregates’ and, in turn, are harming an economy’s long run potential. A focus on ‘monetary and credit aggregates’, at least in theory, should allow the Fed to focus on monetary policy. In practice, though, the Fed, and other central banks, have increasingly veered into fiscal policy. Fiscal policy, in contrast to monetary policy, doesn’t deal with aggregates, but with favoring sectors of an economy, i.e. making what may easily amount to political calls as to who the winners and losers should be. We allege central bankers have created distortions in the credit allocation process. How can one expect to reach an economy's long run potential if policy makers interfere in the credit allocation process? It should not be a surprise the economy is running below its potential when policy makers become central planners. If policy makers then double down, all they might do, is to exacerbate the distortions. Specifically, we have long argued that central banks have compressed risk premia, i.e. made so-called risk assets (really anything other than Treasuries, but risk assets tends to refer to stocks and junk bonds) appear less risky. In plain English, we believe risky borrowers have been getting a subsidy; that in turn, has distorted the capital allocation process of investors, investing in assets that have a higher risk profile than they otherwise would. A common reference is that investors are chasing yield. Instead, the stakeholders of risk assets ought to own the problem. In our humble opinion, the way one gets those stakeholders to own the problem is to allow a market based pricing of risk, one where a risky borrowers pays a reasonable premium. What is reasonable? The Fed should allow the market to determine this; and while the market may not always be right, the opposite is, in our humble opinion, certainly wrong: the Fed cannot possibly know what the appropriate risk premium is. Our central bankers have avoided allowing the market to price risk premia because it might render some issuers, including potentially some sovereign governments, insolvent. And to those who think this is only a problem for the Eurozone (think peripheral Eurozone countries) or Japan, we believe it’s also a problem for the U.S., where we have, amongst others, seen seismic shifts in the capital structure of corporate America. Shifts, such as a raising debt to finance share buybacks, but without an investment in future productivity. We have seen financial assets skyrocket with a major populist backlash because the man (and woman) on the street feels the game is rigged. The Fed disputes this because, all they do, so they might say, is to pursue their inflation target. Our analysis, though, agrees with the complaining public: the game is rigged, as the Fed meddles with efficient capital allocation to the detriment of the economy’s long run potential, as evidenced by low long term rates, in direct violation of the Fed’s mandate. So what does it mean for investors? For many investors, it has meant that they stay on the sidelines, as they don’t like to invest in a game that may be rigged. For others, it has meant to join the ride and enjoy a rise in both equity and bond prices. To us, it means that we might have created a bubble; more specifically, we have created an environment where the traditional way to diversify a portfolio might not be effective should we ever experience a downturn again. The time to truly diversify a portfolio is when times are good. Please register for our upcoming Webinar on Tuesday, September 22, where we expand on the discussion, but also focus on portfolio construction in the context of the election. Also make sure you subscribe to our free Merk Insights, if you haven’t already done so, and follow me at twitter.com/AxelMerk. If you believe this analysis might be of value to your friends, please share it with them.